In a misguided attempt to ensure the population would be prepared for duty, secondary level students had to spend three months or more for the sole purpose of military ‘pre-training’. Children attending military camps in their final year of schooling dare not refuse as this training was set as a prerequisite to graduating. The education system has further disintegrated with the closure of the country’s only university – the University of Asmara. The outbreak of a border dispute with Djibouti in 2008 only helped to fuel the Eritrean government’s fear of re-invasion and condoned the continued militarisation of a people. Independent media has been banned since 2001; persecution is assured for anyone practicing religions other than those officially sanctioned by the state. These interventions have sent out a very strong message to the people — your life is controlled by government, tailored for military service and ends on duty to your country. The destiny of each Eritrean is known to them from the day they are born; they know that even before they are 18, they will be conscripted into national service; they know they might grow up without their parents or older siblings as they would have been forcibly conscripted or their whereabouts unknown. They know that defiance against this militarised regime means detention or arrest without trail, where torture, sexual abuse and forced labour awaits them. It starts to become clearer why an Eritrean would rather gamble his or her life in an attempt to cross a national border guarded by a ‘shoot to kill’ policy, than live a life of muted freedoms. Are we witnessing a country whose insecurity against imagined threats is systematically breeding a nation of refugees and orphans? According to UNHCR, Ethiopia and Sudan are the most ‘popular’ destinations for Eritrean refugees. Israel used to be a popular destination but then the country built a 230 kilometre fence in 2010 to moderate the inflow of refugees and asylum seekers. However, leaving Eritrea and heading to these destinations is not a solution in itself as these countries present problems of their own. Ethiopia is the third largest destination, mainly as a result of their accommodating policy towards Eritrean refugees. Sudan poses a bigger challenge, as many Sudanese people are themselves fleeing their country. The Women’s Refugee Commission acknowledged that Sudan does nonetheless host over 100,000 refugees, of which more than 90% are Eritrean. The most alarming pattern of migration to Ethiopia, as highlighted by UNHCR (2013), is the high number of unaccompanied minors making the journey. 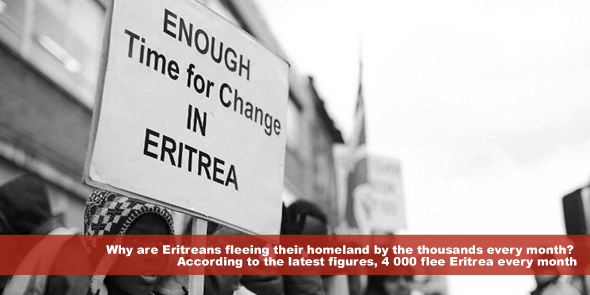 Of graver concern are the number of Eritreans undertaking the hazardous journey through the Sinai to Israel; this number rose sharply from 1 348 in 2006 to 17 175 by 2011 according to UNHCR statistics. The route is reputed as housing flourishing human trafficking, smuggling and kidnapping operations. Reportedly, family members and friends of those kidnapped have to pay astronomical ransoms of 30 000 – 40 000 US Dollars for the lives of their loved ones. Those in captivity are subjected to torture, sexual violence and other unimaginable atrocities. One is prompted to face a harsh truth that, despite awareness campaigns aimed at Eritreans, discouraging them from making the perilous crossing of the Sahara Desert and the Mediterranean Sea they continue to take huge risks. Their actions point to desperation and hopelessness, and more importantly, they speak of a state that has failed its people. Knowing what we know now, envisioning the life that awaits them, that is, toiling for a sub-living wage within the context of indefinite national service, what choice would you have made? Let the world’s attention on this day endeavour to create a daily lived reality where people never have to face that choice. Well, it is really a pathetic situation that has been presented here, I really feel for the Eritreans fleeing their country because, they believe life may be less endangering out there once they survive the wrath of the scavengers on their way. Notwithstanding the failure of Eritrea as a state, the big question to be asked, is what is the AU doing about such an inhumane and gross violations of rights going on there? It is only when it comes to ‘ICC issue’ we start talking of ‘African solutions to African problems’. This article goes to show the state of helplessness of the AU with regards to ensuring respect for human rights and good governance among its member states. AU must act NOW……A well written piece I must say…..big thanks to the author! I bet this dude she never let her office desk and she jumps on writing on anything that she has no first hand knowledge.